Would you like to help your child learn piano? Here is a selection of fun activities and games to play with your child on the piano that will have them mastering the basics in no time. One of the many wonderful benefits of the piano is that it is considered an umbrella instrument. This means you can absorb a great deal about music theory by learning the piano. From notes, octaves, notation, pitch, rhythm, to coordination, aural and songwriting skills, the piano has so much to offer! Give the piano keys personality! While it might seem like a simple task for an adult to remember the seven white keys that make up an octave, for a child that is still learning to read and write, it’s not so easy. To help them get the basics right, turn it into a game. By giving each piano an animal name, they’ll soon know which key is which. Some fun examples include: Cat/Chicken; Dog; Elephant; Frog; Giraffe/Gorilla; Ant; Bear. You can even attach little animal cartoons to the keys to help them remember. Learning piano isn’t all about learning the notes and keys. It’s also a sensory experience. This is why it’s important to give children the freedom to explore the instrument freely on a regular basis. For younger children, ask them to name their favourite story and then let them come up with an improvised song that tells this story. Alternatively you can get them to create a happy song, a sad song, an excited song, a scary song – the choice is almost limitless. With older children you can ask them to create a song on the white or black notes only, or even in a specific key like C major. Other children will simply enjoy the pleasure of having free time to experiment. As a songwriter, I remember spending hours tinkering on my grandmother’s piano. Now I’m an adult with a child of my own, I let my son play ‘nonsense’ on my piano from a very young age. Ever noticed how kids don’t like to sit still? Instead of becoming frustrated, when you can’t beat them, join them! Rhythm games are a great way to get your child moving and help them to develop their sense of rhythm. Not only this, did you know that feeling rhythm, reading rhythm and playing rhythmically are all different skills? Clapping games are a remarkably simple way to help your child with their sense of rhythm. Start by playing a selection of songs from your music collection and have your child clap along to the beat. If you’re a piano player, play some songs on the piano for your child to clap along to. Once your child becomes adept at this skill, ask them to identify the accent notes. For instance, many classical pieces accent beats 1 and 3, whereas popular music usually accent beats 2 and 4. And don’t forget to throw in a 3/4 time signature to mix things up! Older kids can try a ‘Rhythm Train’ or memory game to challenge them further. Clap or play a short rhythm and then have your child clap it back. Once they have imitated your rhythm successfully, keep adding segments to make the rhythm longer and more complicated. It can be a lot of fun developing your child’s ‘rhythm ears’! Another important aspect of learning to play piano relates to pitch. 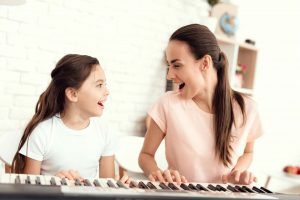 For small children, you can try fun games like asking your child to play what Papa, Mama and Baby Bear sound like (low, medium, high) on the piano. Older and more advanced children will appreciate scale games and interval recognition. Start by playing a scale and then stop on a certain note, asking them to identify which note you stopped on using solfége syllables: do, re, mi, fa, so, la, ti, do. They can sing it back to help them determine the correct note. After they have mastered this skill, you can have them name intervals such as major seconds and major thirds. Let them test you for some extra fun! Many children like the visual appeal of flash cards and this applies to learning the piano too. Create a piano key per card and write the name of the note on one side. On the other side you can draw a visual representation of where the key is on the keyboard. If you would like to encourage your child to read sheet music, include a treble or bass clef note. Once you’ve done this, it’s as easy as showing them a card and getting them to play the corresponding note on the piano. Soon your child will be racing to see how many flash cards they can get through! If this is something they enjoy, time them to see how many they can get right in thirty seconds. Learning the notes that make up an octave is one thing; the next skill to grasp is how these notes can be played in a multitude of combinations. This can be quite confusing for a younger child who is still learning their letters, so it can be helpful to incorporate some spelling fun. Start by using the piano keys to spell out a word like ‘DAD’. Ask your child to tell you what you just spelled on the piano, then try it with other words. As they get better at this skill, you can even get them to close their eyes. Having them guess the keys and the word you spelled will help them to develop their aural skills as well. As you can see, there are lots of different activities you can do with your child to help them learn the basics of the piano in a fun and interesting way. The word ‘variety’ is key here: the more opportunity you give them to experiment with their musical skills, the more chance they’ll have to develop. Good luck!